Little Adventure on the Prairie released last February on both PS4 and Vita. It’s not good. The game consists of walking from left to right, pressing the X button to swing a sword at everything you run into, and occasionally hopping over invisible snags in the level geometry. Its creator didn’t need it to be good, though. He just needed it to sell enough to help him fund his next, more ambitious project. And Little Adventure did sell enough—because Little Adventure has easy trophies. Trophies are a currency by which PlayStation players can measure their progress and compare themselves to other people across the platform. Lots of people don’t pay much attention to them, but some players spend lots of their money and free time chasing trophies to add to their collection and increase the overall tally that shows on their PSN profile and leaderboard sites like PSNProfiles and TrueTrophies. It was this latter group that Salem Al-Ghanim, a 24-year-old programmer from Qatar, was hoping to tap into when he ported Little Adventure from Android. Al-Ghanim told Kotaku in an email that he originally ported the game to 3DS because he wanted to get more experience working with the handheld’s development kit. He and the handful of other people at his makeshift indie studio Infinite Madaa were eager to get experience they can apply to their upcoming game, a turn-based RPG called Chromia. Porting the game to Vita wasn’t intended as a science project though; it was about getting some quick cash. Earlier this week, TrueTrophies, a site tracking millions of PSN users’ trophy information, shared a comparison of its data from the year the Vita was released with 2018. What it found was that the trophy completion rate has gone way up, while the amount of time it takes on average to earn a trophy has fallen dramatically. Games like Uncharted: Golden Abyss and Persona 4 Golden have been replaced with small indie games, most of them ported from the App Store, that no one’s ever heard of. At the top of the list was Little Adventure. Al-Ghanim explained the only requirement to get a platinum trophy into his game was including a certain number of other, lesser trophies. Bronze, silver, and gold, each intended to correspond to the level of difficulty involved in earning them, have a point value, and once a certain threshold is crossed the game is eligible for a platinum trophy. Al-Ghanim’s game has 22 total, all of which are unlocked simply by progressing through the game. Adding the trophies to Little Adventure took a little over a week. Trophy lists can be different for the same game across both PS4 and Vita as well, making it easy for owners of both systems to double-dip. This way someone can buy the game once and effectively get twice as many trophies. Across tracking sites like TrueTrophies and PSNProfiles, Little Adventure has an over 90% completion rate, meaning almost everyone who buys it completes it and earns the platinum. That’s not a hard task, considering it can be done in under an hour, and simply playing through the game normally will earn the player all of the trophies in the game. Just over 8,000 of PSNProfile’s users own the game PS4, and almost half of them have gotten the platinum on the Vita version as well. Little Adventure only costs $2, which also helps. For an hour’s time and a couple bucks, any player is guaranteed two platinums. The game ★★★★★ 1000 Top Rated got attention last summer for offering a near-instant platinum trophy. The developer of the game, which cost $0.98, later stated in a Facebook post that Sony had temporarily taken the game down and told it not to mention trophies in the store trailer. Over a year later, the game is still not back up, but the trend itself is alive and well. The popularity of trophies has given some smaller developers an incentive to port their games to a mostly dead console. Whether that’s good thing for the Vita is debatable. One convincing explanation TrueTrophies posited is that many of the people still playing the Vita are doing so just to score easy trophies that pad out their overall numbers. “What are some Vita games with easy trophies” is a favorite recurring topic on the handheld’s dedicated subreddit. 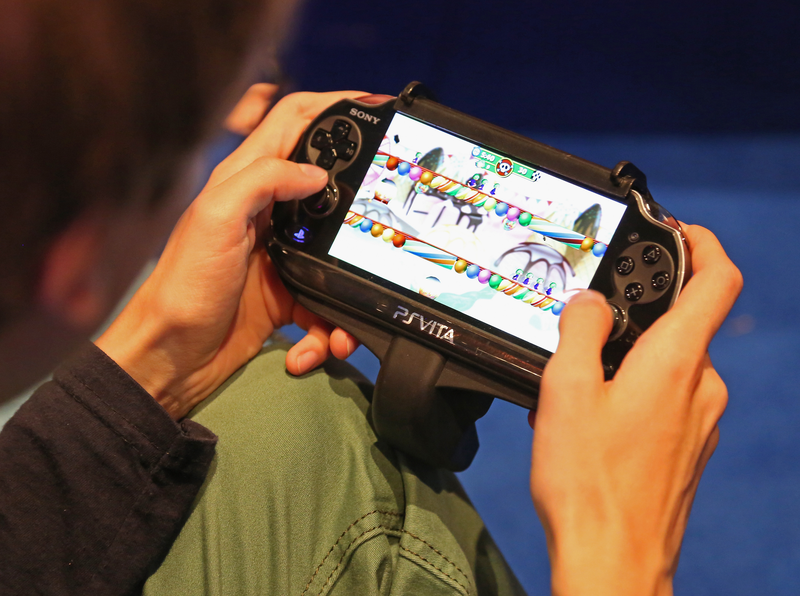 Only 60 games have been released on the Vita in 2018, and many of them are similar to Little Adventure. In many ways the Vita’s store now has more in common with the Google Play Store or Steam’s unfiltered list of upcoming releases than it does with a typical, well-curated console marketplace. But game’s like Al-Ghanim’s have proven the Vita may still live on for a while yet as a glorified trophy hunting peripheral. Correction: an earlier version of this article mistakenly identified Little Adventure on the Prairie as being cross-buy. It must be purchases separately across both PS4 and Vita.